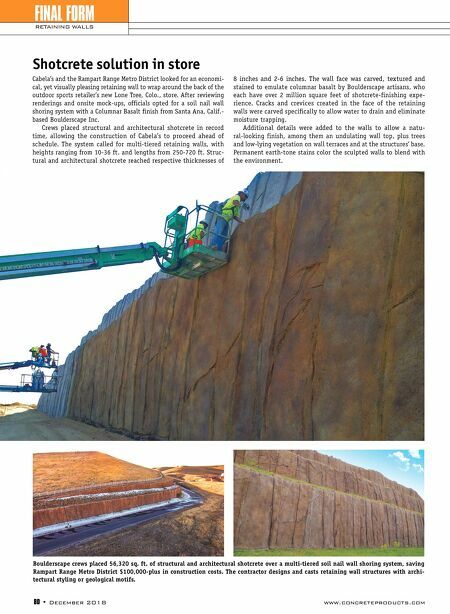 80 • December 2018 www.concreteproducts.com FINAL FORM RETAINING WALLS Cabela's and the Rampart Range Metro District looked for an economi- cal, yet visually pleasing retaining wall to wrap around the back of the outdoor sports retailer's new Lone Tree, Colo . , store . After reviewing renderings and onsite mock-ups, officials opted for a soil nail wall shoring system with a Columnar Basalt finish from Santa Ana, Calif . - based Boulderscape Inc . Crews placed structural and architectural shotcrete in record time, allowing the construction of Cabela's to proceed ahead of schedule . The system called for multi-tiered retaining walls, with heights ranging from 10-36 ft . and lengths from 250-720 ft . Struc- tural and architectural shotcrete reached respective thicknesses of 8 inches and 2-6 inches . The wall face was carved, textured and stained to emulate columnar basalt by Boulderscape artisans, who each have over 2 million square feet of shotcrete-finishing expe- rience . Cracks and crevices created in the face of the retaining walls were carved specifically to allow water to drain and eliminate moisture trapping . Additional details were added to the walls to allow a natu- ral-looking finish, among them an undulating wall top, plus trees and low-lying vegetation on wall terraces and at the structures' base . Permanent earth-tone stains color the sculpted walls to blend with the environment . Shotcrete solution in store Boulderscape crews placed 56,320 sq. ft. of structural and architectural shotcrete over a multi-tiered soil nail wall shoring system, saving Rampart Range Metro District $100,000-plus in construction costs. The contractor designs and casts retaining wall structures with archi- tectural styling or geological motifs.